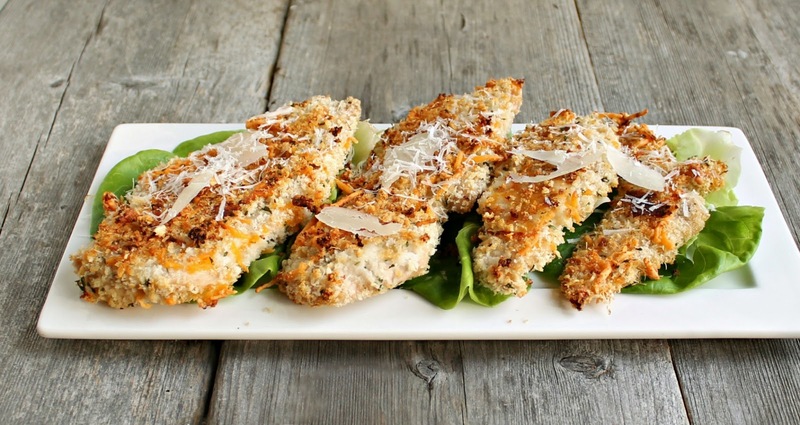 Breaded chicken cutlets that are baked in the oven instead of fried. Boring. Yawn. Zzzzz. Everybody knows how to make those, right? Well, until recently, that would be everybody except me. The few times I'd tried it I ended up with dry, flat tasting chicken that made me feel like I was the only person on earth who couldn't cook this simple dish properly. As an adult living with DFP (deep fry phobia), I'm quite adept at making 'oven fried' taste great...except for that damn chicken. But I talked myself into trying again and this time took a page out of the fried chicken playbook by marinating my cutlets in buttermilk. And that, I finally discovered, is the secret to moist, tender oven baked breaded chicken. For those of you that knew this and have been doing it this way forever, just ignore my little light bulb moment. But if any of you have been secretly struggling and suffering in dry chicken silence, go make this right now. Enjoy! Pre-heat the oven to 425 degrees, line a baking sheet with parchment paper and spray with non-stick cooking spray. Pour the buttermilk into a deep dish, add the chicken and marinate for 15 minutes. In a separate dish, combine the breadcrumbs, Parmesan and cheddar cheeses. Remove the chicken from the buttermilk and coat thoroughly on both sides with the bread crumb mixture. Place on the baking sheet and spray the chicken with non-stick spray. Bake for 10 minutes, flip, spray the other side of the chicken with more non-stick spray and continue baking for an additional 10 minutes. Makes approximately 4 servings. I hate frying chicken. HATE it. This will cure my ails! Your chicken looks so mouth watering good. My grandma used to make the best fried chicken. Back in the day, I used to make Fried chicken, but I haven't made it in years. 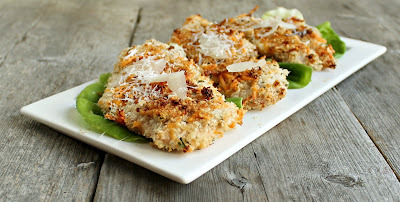 I'll have to make this one for my Hubby, because it looks relatively healthy and so yummy! Glad you found the buttermilk secret and the end to dry baked chicken. I love oven fried chicken! If I have the time I'll do an overnight soak in the buttermilk! Next time I think I need to add the cheese. What a great way to satisfy the craving for fried chicken. This looks so much better (and I know it is better for your body too!) Thank you so much for sharing. That looks like amazing chicken! Pinning this and trying it soon! Mmmm, looks finger lickin' good. I have been craving fried chicken, this will fit the bill. I do know the buttermilk trick...but I need to use it more often. I must make this chicken when Nick gets home from college...it looks fantastic! I had no idea - in fact, there is a family joke that my husband brings up rather often about my "taco chicken" that is baked and even the dogs ran from it. However, since I've been cooking your recipes I have become much more familiar with buttermilk and its uses - in fact, I generally have some in the freezer just in case you post a must-try-right-now recipe and I think this is one of those! I can't wait to try it. I love marinating chicken in buttermilk. It's so good! That breading looks amazing! I love using buttermilk to get that down home fried taste. I don't blame you for having a frying phobia. A giant cauldron of bubbling oil scares me too. But, I still occasionally don an apron and get greasy every now and then. your chicken looks so good!! definitely bookmarking this! I love fried food but hating frying, so I thank you for sharing your secret! 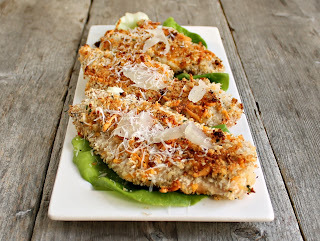 I've only ever made crispy baked chicken strips, not crispy chicken breast. And I've been craving fried chicken, so perfect! We just made this last night, and it was great. The buttermilk really makes this recipe. I adore schnitzel, too. We went to Germany when I was a kid and I had it every night for dinner. Your crispy chicken looks fabulous. Thanks for sharing on Thursdays Treasures. This sounds and looks wonderful. Can't wait to try it....I even have buttermilk on hand! Thank you so much for sharing at Weekend Potluck. Please come back soon.